Designed with a compact plug and play color LCD display, the Informeter allows you to monitor, set warning points and datalog your vehicles performance though it's own OBD sensors. Select through important signals like Speed, Tach, Temps, Air Flow, Voltage, etc. (up to 25 channels), to monitor. The easy to use navigation menu allows you to select between various screens and displays: Digital, Analog or Bar Graph and 2ch, 3ch, or 6ch screens. You can also set warning points and pre-warning points, which will alert you with audible and visual highlights of important readings. Datalog up to 6 channels of data, and replay them. This is great for tuning. In addition to being functional the Informeter is also infinitely fashionable. Seamless changes in backlighting color, GReddy signature wall papers and colored backgrounds, along with a clear bezel to install colored face plates or even custom face plates, offer a endless options to match any vehicles interior. And to aid in mounting the unit can flip the display 180 degrees to free even more options. 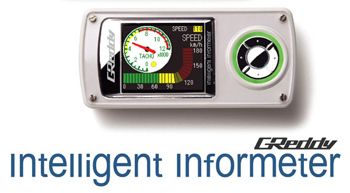 The GReddy Informeter is a key tool for all; beginners to pro tuners. Want this item shipped out today, April 23? Order within the next 12 hrs 50 mins.